Choosing a monument, memorial or marker to honor a loved one should be carefully thoughtout beforehand. There are many things to consider. To begin with, the cemetery you choose may or will have certain gravesite regulations that will affect what you can and cannot do. We will contact your cemetery for you to learn of their their regulations, so we can advise and guide you properly in your selection regarding your compliance with these regulations. Your loved one was unique. With this in mind, we can begin creating a memorial that is as one of a kind as he or she was. 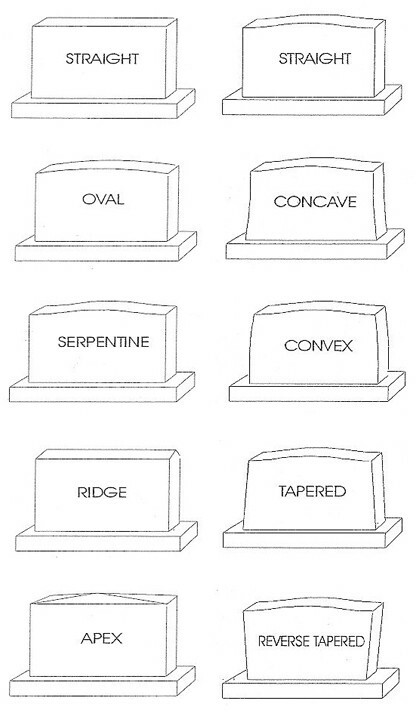 We can help you choose the monument type, stone color, size and shape that will best tell their story for generations to come. A fine etching or permanent photo of your loved one or an etching of a favorite scene or hobby they loved can also be depicted. Another important element is the selection of an Epitaph or Verse. This can be a simple and elegant touch – to be read and reflected on by future generations. We will guide and assist you through the entire process. It’s our experience, care and attention to detail that sets us apart. Our best advice is to take your time – don’t rush – and allow the ideas and process to flow naturally. Often, simplicity is the key to a very beautiful, inspiring monument. Whatever you decide, we will help you create a loving memorial that your family will cherish and love forever. The engraved marker portion is known as a “die.” Most are usually 6? or 8? thick. The horizontal portion is known as the base and is usually required. The larger size allows for more personalized expression and room for engraving. Scenic designs and the family name are popular additions on the back. Upright slant shape. The thickness identified during ordering is the thickness of the base. The top is usually 2 inches thick. The top can be flat, oval, or serpentine shaped. A standard 2 inch to 4 inch nosing is recommended. This protects the polished etched surface. A base is optional and usually not required. Designed to lie flat at lawn level. All are a minimum of 4 inches thick. Provides burial information for a single individual. May be used for individual or ordered double width for a companion. Often called a Pillow Marker or Hickey. Slight bevel slant from back to front of marker. Usually 6? or 8? thick, however, thicker markers are available. Covers the entire length of the buried. Much easier to maintain as the marker does not need to be moved for ground burials. Very popular for both a memorial and as a cremation memorial. Base is usually not required. Some style benches can hold the cremains of up to 6 loved ones. Enhances the beauty of burial garden. Area available for expression, decoration, and engraving is variable with the size of the stone and the polished face. There are many different finishes available on our granite monuments and markers. All flat markers, bevel markers, and slant monuments have a polished face. Upright monuments are polished on the front and back. All bases are polished on the top. You may choose to have more sides or the entire marker polished at an additional charge. Visible surfaces that are not polished are rock pitched. The bottom of all markers are usually sawed since they are not visible. Flat Carving: Outline only, without shape. Shaped Carving: Textured and dimensional. Simple Carving: Simplistic flower or leaf design. Band Carving: Continuous carving around memorial. BAS Relief Carving: 3 Dimensional, Very complex and expensive. Etched designs must be on either black, dark red or dark mahogany granite. They are not suitable for gray or white granites. For truly exceptional etchings, we strongly recommend Jet Black granite. Flash Black can also be etched, although the etching doesn’t show up quite as well as on Jet Black. Complexity of design and size of memorial determine etching cost. We are capable of etching any design into granite that you want to create. Plain etching results from the natural color of the granite appearing through the granite polish. Color etchings are created from using different colors of special lithochrome paint in a plain etching.To see photos of monuments with etchings in our Photo Album section, click here. The different kinds of panels that are used for lettering are called “Family Name Panels” and “Inscription Panels”. Family name panels may be placed on the front and back side of an upright monument. This must be indicated when you order. We assume all engraving and etching are on the front of the marker unless otherwise specified. The finish for a panel may be frosted or polished. Frosted-finish panels will appear to be lighter than the granite color and not shiny. There are a wide variety of tops and ends available. However, if you want a memorial with tops and ends that are different or unusual, those designs will usually be more expensive.